Special trading price bars almost always mean the same thing, so you can focus on a few of the common special bars with confidence in their reliability. Use logic and common sense when you’re looking at special bars. You’re trying to understand what buyers and sellers might be thinking, so keep it simple. Don’t think that you’ve found a zebra when you’re looking at a horse. The first two bars show the close at the high at about the same level. On the second bar, the low of the day was lower than the low the day before, meaning that sellers came out of the woodwork. The close was still at the high, trumping the lower low because the bulls fought back, buying more and more. Day three delivers a whopping gain — and a third close at the high. By now you may be ready to bet the ranch on this configuration. Your instincts are right, with one caution: A big gain is often followed by profit-taking by active traders. Three days isn’t enough to call this configuration a trend, so traders call it a move. Profit-taking doesn’t change a trend, but can dent performance the next day. You may see a lower high or a lower close. 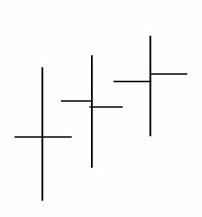 You can use your imagination to envision the parallel configuration of the preceding figure — closes at the low. As you may expect, a series of closes at the low imply that a downtrend is forming or worsening. The high is lower than the previous day’s high. The low is higher than the previous day’s low. An inside day is a bar “inside” the previous day’s high-low range. It reflects indecision. Buyers didn’t feel strongly enough about this security to buy more. Sellers weren’t particularly inspired to sell, either. The inside day doesn’t suggest what’s going to happen the following day. But it does warn that the market is starting to reconsider what it feels about this security. The open is at the low, and the close is at the high. This configuration suggests that something new has happened to inspire bullish buying right up to the end of the day. The open is at the high, and close is at the low. You can deduce the opposite supply-demand setup here. Sentiment turned bearish and sellers overwhelmed buyers, right to the end of the day. No trend exists. The outside day alerts you to a possible trend beginning. A trend is in place. The outside day may suggest a reversal or a continuation, depending on where the open and close are and which direction the security is trending. The outside day has a higher high by definition, but a higher close as well implies continuation in an uptrend and reversal in a downtrend, especially if the close is exactly at the high. Similarly, the outside day has a lower low by definition, so it confirms continuation in a downtrend, especially if the close is at the low. 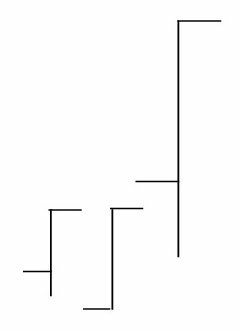 This figure shows a series of bars where the close is at or near the open. As you can guess, a close at or near the open reflects indecision among market participants. 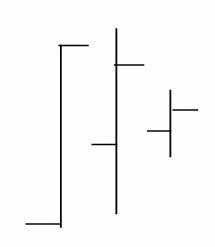 Trader opinion is divided as to whether this bar generally signifies a continuation or reversal pattern. Consider it a clue to look at what else is going on, such as trading volume. In an uptrend: If the open and close are near the high, look for the uptrend to accelerate (continuation with gusto). 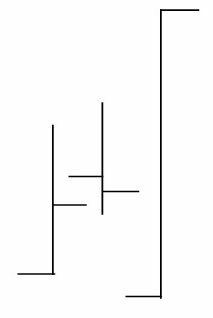 If they are near the low, look for a reversal. In a downtrend: If the open and close are near the low, expect more of the same. If they are near the high, think about a reversal.